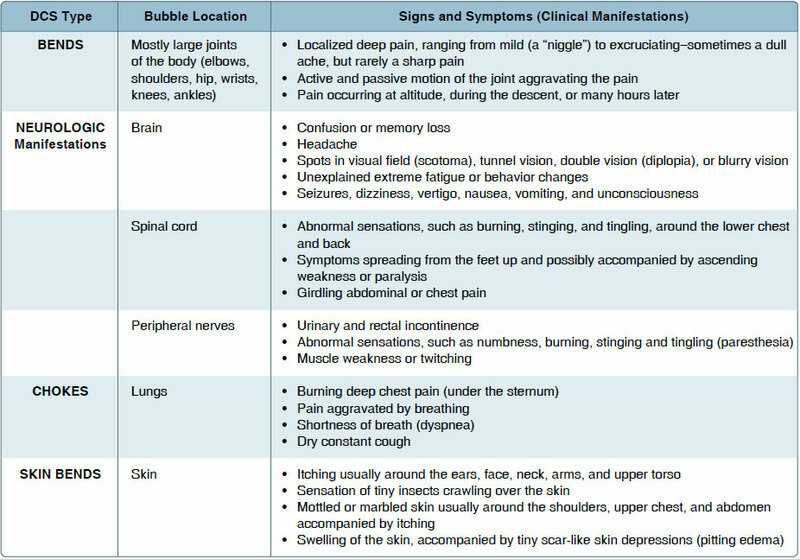 Decompression sickness (DCS) describes a condition characterized by a variety of symptoms resulting from exposure to low barometric pressures that cause inert gases (mainly nitrogen), normally dissolved in body fluids and tissues, to come out of physical solution and form bubbles. Nitrogen is an inert gas normally stored throughout the human body (tissues and fluids) in physical solution. Put on oxygen mask immediately and switch the regulator to 100 percent oxygen. Begin an emergency descent and land as soon as possible. Even if the symptoms disappear during descent, land and seek medical evaluation while continuing to breathe oxygen. If one of the symptoms is joint pain, keep the affected area still; do not try to work pain out by moving the joint around. Upon landing, seek medical assistance from an FAA medical officer, AME, military flight surgeon, or a hyperbaric medicine specialist. Be aware that a physician not specialized in aviation or hypobaric medicine may not be familiar with this type of medical problem. Definitive medical treatment may involve the use of a hyperbaric chamber operated by specially-trained personnel. Delayed signs and symptoms of altitude-induced DCS can occur after return to ground level regardless of presence during flight. Scuba diving subjects the body to increased pressure, which allows more nitrogen to dissolve in body tissues and fluids. [Figure 17-11] The reduction of atmospheric pressure that accompanies flying can produce physical problems for scuba divers. A pilot or passenger who intends to fly after scuba diving should allow the body sufficient time to rid itself of excess nitrogen absorbed during diving. If not, DCS due to evolved gas can occur during exposure to low altitude and create a serious inflight emergency. Figure 17-11. 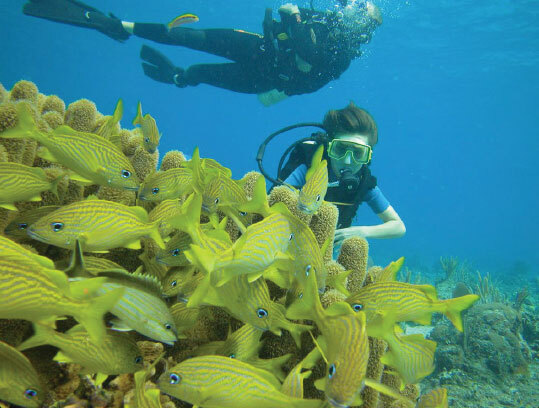 To avoid the bends, scuba divers must not fly for specific time periods following dives. The recommended waiting time before going to flight altitudes of up to 8,000 feet is at least 12 hours after diving that does not require controlled ascent (nondecompression stop diving), and at least 24 hours after diving that does require controlled ascent (decompression stop diving). The waiting time before going to flight altitudes above 8,000 feet should be at least 24 hours after any scuba dive. These recommended altitudes are actual flight altitudes above mean sea level (MSL) and not pressurized cabin altitudes. This takes into consideration the risk of decompression of the aircraft during flight.